There were questions yesterday about cutting for the dies. This die will cut 6 layers at a time so I have 6 different fabrics in a stack. 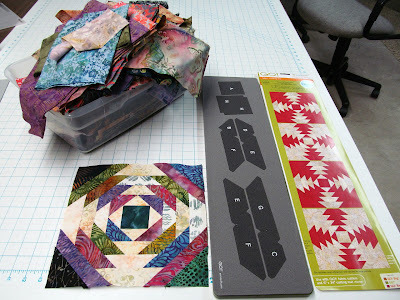 If you are making a 2 color quilt, all 6 pieces would be the same fabric. The insert in the die package tells me how big to cut the pieces. Here I have put the stack on top of the section that needs to be cut with dark fabrics. Then I look back at the package insert and it tells me what size to cut for this next section which is light fabrics. Then I place them on the die. Now I have added the third stack of 6 fabrics on the die. I don't need to cut any on the place marked A because I already have a supply of 2.5" squares. Now the plastic top layer gets added and it gets cranked through the die cutter. You can go to Accuquilt's website and see videos of layering and cutting. 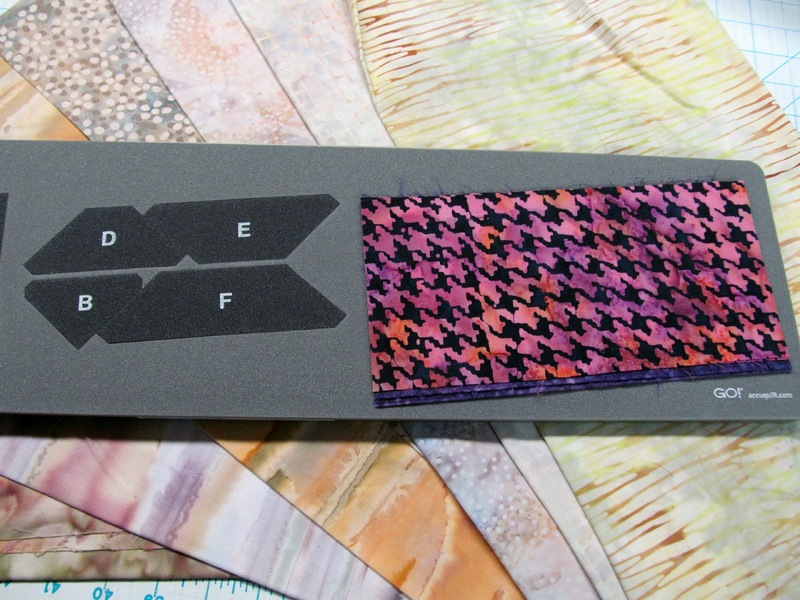 A lot of people call their cutter an Accuquilt but that is the company name; each cutter has its own name. GO!, GO!BABY, GO!BIG and Studio 1 or Studio 2. Their website will give you all of the info. This is the photo I showed a few days ago with the die and the insert from the package laying next to it. There is also a large bin of batik scraps from which I have been doing most of the cutting. 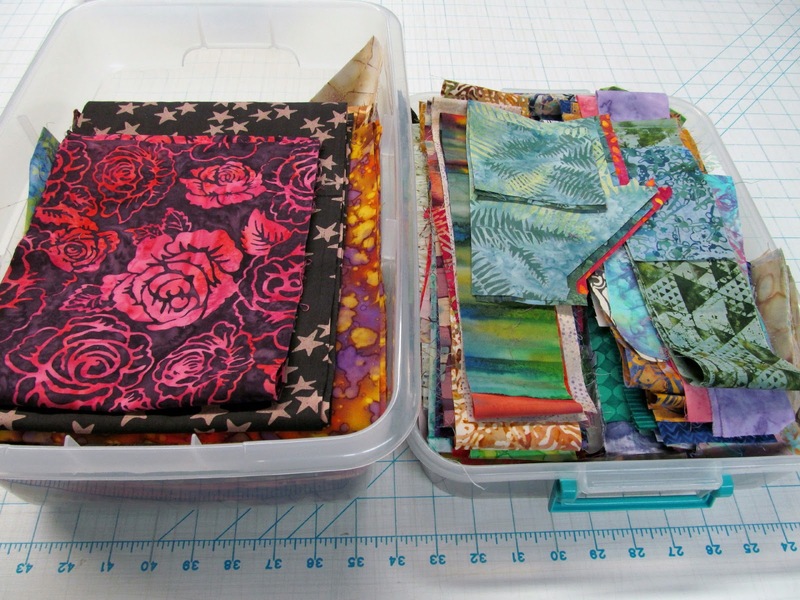 After several days of pressing and cutting I now have 2 neat boxes of pieces, larger ones but less than 1/4 yard is on the left. The one on the right is pieces too narrow to cut the pineapple log cabin chunks. All are nicely pressed and ready to use for another project. Even after pressing and cutting all day yesterday I still have more to do. There are 21 pieces of dark and 16 pieces of light in each block. Now to make the reverse blocks I need 21 light and 16 dark pieces of the proper length. I like every piece different in a block and I don't want all of the blocks to be be identical so that means more than 70 dark fabrics and more than 70 light fabrics to have the look I want. You have been working hard to prep all those batik scraps, but you are putting them to such good use! That pineapple quilt is going to be so colorful! I thought it might be a big job but actually the cutter seems to be fantastic. I wonder how many of these pineapple quilts a person would make to justify the expensive dies? The die certainly makes prepping a lot easier - and more accurate too. 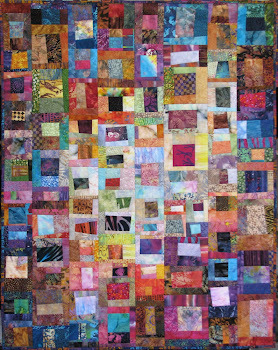 The block looks so pretty with all the different fabrics. WOW Wanda, that is a great tuitorial ! 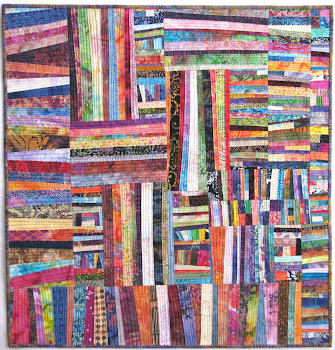 As you know I'm not a quilter but love them and your blog. But do know tailoring well. It is still hours and hours of work but so worth it to have each piece cut so perfect. It is still -10 degrees here.... But the sun is out (^._,^). Remember those days ? Think I'll wait to get my 2 miles in today . You answered excellently. I have to watch for a sale now. Today is my one year heart attack anniversary. I hope your health is top notch today! Great explanation for those who don't regularly use die cutting in their process. Good luck with all those different fabrics!! One of the many reasons why I love your blog. Not just a Show and Tell, but good, solid information written well. My friendship group purchased the GO! unit several years ago and we all use it, some more than others. 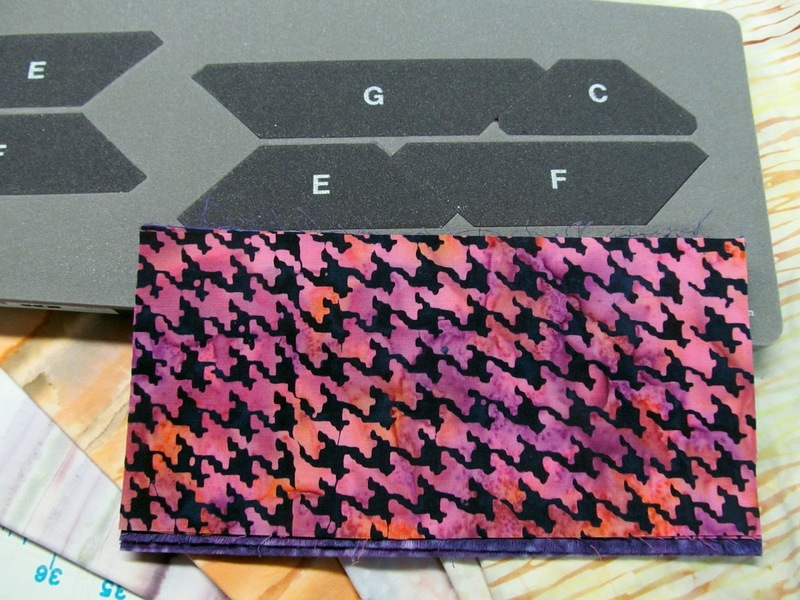 In fact, after seeing yours, I just recently purchased the Half Hexie and used lots of authentic African cloth that I had been collecting for years.